If I had to describe this book in one sentence, a sentence that could describe the entire series, it would be that Cimorene is the only sane person in a world that runs on fairy tale logic. Cimorene is a princess, who is malcontent with the usual princessly duties. So she decides to run away and become a dragon’s princess. At first things seem perfect, the dragon Kazul is less interested in eating Cimorene, and more interested in her Cherries Jubilee. But things aren’t all as ideal as they seem. 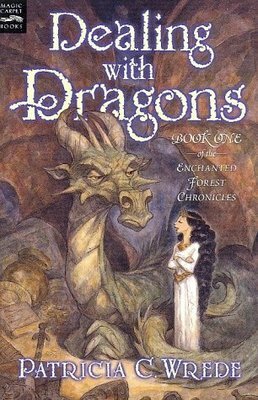 A dragon’s princess is a highly valued potential wife for knights and princess, and soon Cimorene finds herself having to turn away the overzealous suitors. To make things worse, the dragon Woraug wants to eat Cimorene, and some wizards have been caught snooping around the dragons’ territory. Cimorene went to the dragons looking for a more interesting life, and it looks like she’s found exactly that. As an adult reading a middlegrade book, I usually have to adopt a very different mindset than I do when reading adult fantasy. Dealing with Dragons is very fast paced, as most middlegrade books are, with some pretty nifty character development woven into it. The trick is that the characters are fairly simple, not simple in a bad way, more simple in an elegant way. They are exactly what they need to be and don’t waste time trying to expand beyond what is necessary. The only real downside I can think of for this book is that it lacks a sense of danger. The main threat, the wizards, are easily taken care of in a comedic way. And while this does work in the book’s favor, giving it the light hearted whimsy it is aiming for, it does negate the seriousness of the threat. But the book is imaginative enough that the tenuous plot doesn’t detract from it. Since it is meant to be a comedy, the majority of the book focuses on the quirky characters, and the day to day problems of living in a world that runs on fairy tale logic. This book is highly recommended for younger readers, as well as for adults that feel the need for a quick, lighthearted read in their lives.